Field Initiative Title: Southeast Deep Coral Initiative (SEDCI): exploring deep-sea coral ecosystems off the Southeast U.S. In 2016, NOAA’s Deep-Sea Coral Research and Technology Program started a four-year initiative to study deep-sea coral and sponge ecosystems off the Southeast United States. The initiative is a cross-line office effort that includes scientists from NOS, NMFS, OAR and NESDIS, and works in close collaboration with federal and academic partners to collect scientific information needed to manage deep-sea corals throughout the Southeast U.S. Region. This project began in 2016 and will run through 2019. Deep-sea corals, also known as cold-water corals, are corals that do not rely on sunlight, and therefore are typically found in deeper waters (>50 m). Deep-sea corals occur in all oceans, and under favorable conditions, form dense aggregations that create habitat for a myriad of species. These ecosystems are some of the richest and most diverse in the deep sea, yet they are often overlooked by managers, scientists and the general public, who may be unaware that rich and diverse communities can thrive in deep waters under the right conditions. While deep-sea coral ecosystems are out of sight and out of mind to most, they are not immune to anthropogenic impacts, as deep-sea trawling, oil and gas exploration, submarine cable laying and ocean acidification threaten these systems much more than their shallow-water counterparts. Deep-water corals are particularly vulnerable to such impacts, because they are typically slow growing and long lived (on the orders of centuries to millennia), and as a result require very long timescales to recover from disturbances. The objective of SEDCI is to study deep-sea coral ecosystems throughout the Southeast United States in order to further the management, conservation and protection of these important deep-water ecosystems. Left: Thorny tinselfish swimming above a dense aggregation of deep-sea corals at 496 m on the West Florida Slope in an area that is currently being considered for the establishment of a new habitat of particular concern by the Gulf of Mexico Fishery Management Council. The community was surveyed using ROV Odysseus during a 2017 SEDCI-supported expedition aboard NOAA Ship Nancy Foster (credit: NOAA-Pelagic Research Services). 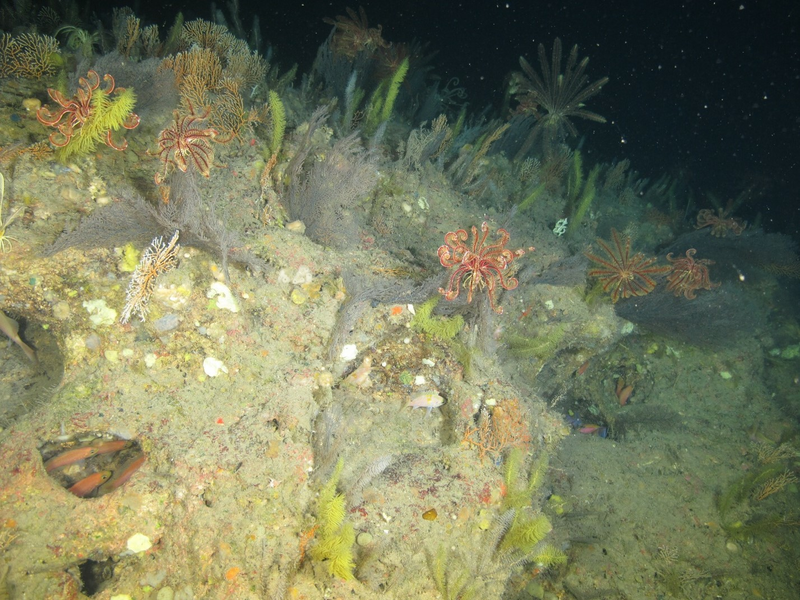 Right: A dense community of black corals and crinoids at 122 m depth on Elvers Bank in the northwestern Gulf of Mexico in an area that is currently being considered for expansion of the Flower Garden Banks National Marine Sanctuary. The community was surveyed using ROV Mohawk during a 2017 SEDCI-supported expedition aboard R/V Manta (credit: NOAA-FGBNMS/UNCW-UVP). SEDCI conducts multiple research expeditions each year, which survey deep-sea coral ecosystems using ships, submersibles and other equipment. Additionally, SEDCI conducts complementary research projects focused on seafloor mapping, species identification, habitat suitability monitoring, environmental monitoring and data mining. These efforts will provide important baseline information that is needed to support management efforts of deep-sea coral ecosystems throughout the Southeast United States. The priorities of SEDCI were developed in consultation with fishery management councils, national marine sanctuaries and other resource managers of the Southeast United States, including partners from the Bureau of Ocean and Energy Management (BOEM) and the U.S. Geological Survey (USGS). There are several proposals for the establishment of new managed areas in deep waters of the Southeast United States, including proposed expansions of the Flower Garden Banks National Marine Sanctuary, potential new habitat areas of particular concern in the Gulf of Mexico, and new special management zones in the U.S. South Atlantic. SEDCI expeditions will survey many of these proposed managed areas in 2016-2019, and thereby provide important information that is needed to evaluate these proposals. SEDCI focuses on studying deep-sea (>50 m) coral ecosystems throughout the Southeast U.S., a region including the U.S. federal waters of the Caribbean Sea, Gulf of Mexico and South Atlantic Bight. This area corresponds to the cumulative extent of the jurisdictions of three fishery management councils, including the Caribbean, Gulf of Mexico and South Atlantic Fishery Management Councils (CFMC, GMFMC, SAFMC). Furthermore, this area includes numerous areas where deep-water corals are protected, including three national marine sanctuaries, and various other marine protected areas. SEDCI focuses on surveying deep waters in and around these areas in order to support management efforts. Map showing the three geographic regions where the Southeast Deep Coral Initiative (SEDCI) will operate in 2016-2019. Areas where deep-sea corals are protected through fishing restrictions are shown in orange (credit: NOAA). Wagner D & Shuler A. 2017. The black coral fauna (Cnidaria: Antipatharia) of Bermuda with new records. Zootaxa 4344(2): 367-379. Wagner D, France SC & Adams C (2018). 2018: A shift in the focus of deep-sea explorations. Oceanography 31(1 Suppl. ): 100-101. Etnoyer PJ, Wagner D, Fowle HA, Poti M, Kinlan B, Georgian SE & Cordes EE. In press. Models of habitat suitability, size, and age-class structure for the deep-sea black coral Leiopathes glaberrima in the Gulf of Mexico. Deep-Sea Research II. Hourigan, T.F. *, McGuinn, R.P., Etnoyer, P.J., Wagner, D., Dornback, L.M., Poti, M.D., Coleman, H.M.
NCCOS News Story. April 6, 2017. NOS Weekly Update. January 12, 2017. NCCOS News Story. January 12, 2017. Deep-Sea Life, issue 8. November 2016.
collect water samples and monocore samples during specific CTD casts. 1. to continue documenting the biological communities on Parker, Bryant, Bouma, Rezak, Sidner, and Elvers banks - all of which are under review for the proposed boundary expansion of the FGBNMS. 2. to analyze the benthic habitat in the areas of interest by conducting transects using a forward-facing still camera and video camera mounted to the ROV to capture high resolution imagery and video, following DSCRTP protocols. 3. to collect samples of mesophotic black corals and octocorals for analysis by researchers from CUNY and UTRGV, respectively. 5. opportunistically collect water column acoustic data to characterize the relative abundance of pelagic fishes of the region. Assemble maps of geo-referenced coral locations and associated data. Collect biological specimens of mesophotic corals, sponges, and associated taxa. The objective of this project is to create a photographic guide of the most common fauna associated with deep-sea coral and sponge ecosystems in the Southeast Region. The guide will consist of high-quality, in situ photos of deep-sea corals and sponges, but may also contain images of associated fauna. These images will be shared with scientists participating in SEDCI fieldwork to ensure that species names are used consistently throughout the effort. Furthermore, the species guide will be shared more widely via a web-accessible platform (Deep-Sea ID and World Register of Deep-Sea Species), in order to provide a tool that can be used by the broader scientific community, as well as for education and outreach purposes. This projects seeks to create a web-accessible GIS geodatabase that includes information from previous deep-sea explorations in the Southeast Region, including (1) submersible/ROV dives, (2) mapping surveys, (3) museum collections of deep-sea corals and sponges, (4) deep-sea coral habitat suitability models, and (5) boundaries of marine managed areas. This geodatabase will be used to guide the research efforts of the SEDCI throughout the region. Specifically, the geodatabase will be used to identify areas targeted by past research efforts in the Southeast Region, and areas which need to be sampled, surveyed and mapped to meet the objectives of the SEDCI. This project proposes standard, low-cost methods to measure temperature at mesophotic depths (30-150 m) and aragonite saturation in deeper water (300-1500 m) adjacent to deep-water coral aggregations in order to generate new public data. This project will deploy 9-12 new temperature sensors in the Flower Garden Banks region and the U.S. Caribbean, from 40-150 m depth, in order to extend the vertical range of present studies over the course of 1-2 years. The data will augment ongoing shallow-water temperature records to answer the question, how deeply in the water column do surface anomalies penetrate? The project will repeatedly deploy a CTD-rosette to 1500 m depth for a series of water column profiles from the shelf break to the shelf slope collected over a two-year time frame. Our goal is to perform laboratory water chemistry for ocean acidification parameters (pH, TA, DIC, salinity, nutrients) for 12-24 water column profiles (100-200 water samples) collected over the course of the two-year field research time frame. 4 the use of models to help synthesize and generalize results of field surveys. This project will work collaboratively with Puerto Rican deep snapper fishery to deploy low- cost, simple underwater video cameras along with deep-water line-fishing gear to explore bottom habitats associated with these deep-water fisheries. The goal of the project is to use a simple, low-cost method to glean some introductory information about important deep-water habitats to help focus more in-depth habitat characterization research in the future. This project will support personnel to review, analyze, and compile previously collected video and still image data from benthic surveys of deep-sea coral and sponge communities (azooxanthellate deep-water corals and sponges that occur deeper than 50 m depth) that were collected during NOAA-funded research expeditions in order to incorporate these observations into the National Database of Deep-Sea Corals and Sponges. This project will review previously collected ROV data at depths between 50-300 m in the U.S. Caribbean. Deep-sea coral and sponge records from the video data will be retrieved and formatted for submission to the National Database of Deep-Sea Coral and Sponges. NOAA’s Flower Garden Banks National Marine Sanctuary has been investigating the Northwestern Gulf of Mexico since 2001 and possesses an extensive record on mesophotic coral ecosystems that exist in the region. Environmental data and geo-referenced photos of benthic habitat and biology existing from previous investigations, as well as investigations scheduled to take place in 2017 and 2018 will be used to generate habitat characterizations maps, as well as predictive habitat models in the Northwestern Gulf of Mexico. While a significant amount of data has been generated, there continues to be expansive areas that remain unmapped and lack ground truthing evidence. The planned cruises will help fill in some of these data gaps following DSCRTP protocols. The underwater features for which habitat characterization maps will be generated include the following banks: Horseshoe, MacNeil, Rankin, 28 Fathom, Bright, Geyer, Elvers, McGrail, Sonnier, Bouma, Bryant, Rezak, Sidner, Alderdice and Parker. The primary objectives for this project include to (1) conduct habitat data analysis of historic photo transects collected at the sites listed above, (2) conduct analysis on imagery collected in planned 2017/2018 cruises according to the FGBNMS habitat scheme, (3) generate habitat maps that accurately represent the environments found on the seafloor features of interest using a habitat suitability model, and (4) input density and species data into the DSCRTP data portal. This project will ensure that the deep-sea coral data and habitat information collected during the 2005 East Florida R/V Edwin Link expedition that was used in a graduate thesis is prepared as a manuscript for peer-review and is formatted and submitted to the DSCRTP National Database in a format consistent with the database. Prepare and submit a peer-reviewed manuscript from data generated during a 2011 research cruise funded by NOAA and CIOERT that provide data on deep-water coral and sponge occurrence and densities, and general deep-water benthic assemblage characterization and distribution off the Southeast U.S. coast (east coast of Florida and Florida Keys). This project will analyze ROV video recorded from deep-sea coral habitats off South Carolina and Georgia during a cruise aboard the NOAA Ship Pisces in 2010. Videos will be analyzed by substrate type, and fishes and sessile invertebrates enumerated within each type. Descriptive statistics and multivariate analyses will be used to determine associations among fish species and between fish species and habitat types. This expedition will conduct Remotely Operated Vehicle operations at multiple banks in the Northwestern Gulf of Mexico currently undergoing review for potential FGBNMS expansion. The researchers will capture HD video and high resolution imagery of sites of interest, explore unknown sites, conduct DSCRTP transects, and collect samples of mesophotic corals. This project will obtain deep-sea coral and chemosynthetic organism presence and absence data in the vicinity of the Deepwater Horizon oil spill prior to the spill. This data will be used to produce habitat suitability models for deep-sea corals and chemosynthetic ecosystems in the Gulf of Mexico. The goal of the cruise is to gather additional data on habitat and fish assemblages in six of the South Atlantic marine protected areas (MPAs) and Oculina Experimental Closed Area (OECA) as part of a long term sampling program to document changes in these areas before and after fishing restrictions are implemented. The scientists will conduct ROV and multibeam sonar surveys inside and outside six MPAs as well as inside and outside the OECA in the south Atlantic to assess the efficacy of this management tool to protect species of the snapper grouper complex and Oculina coral. The southernmost boundary of the work areas will be Port Canaveral, FL while the northern-most boundary will be Cape Hatteras, NC. This cruise will be conducting the twelfth year of an ongoing scientific research mission funded by NOAA’s Coral Reef Conservation Program. The purpose of the cruise will be to collect swath bathymetry, acoustical backscatter, ROV optical validation, fishery acoustics, and Slocum Glider deployments within coastal waters of Puerto Rico.